More than 6 million voters are expected to participate in Bolivia’s national elections on October 12, a day also celebrated—not coincidentally—as Bolivia’s national “Day of Decolonization.” Unlike two other leftist Latin American presidents (in Brazil and Uruguay) whose parties are engaged in tightly contested electoral contests this month, President Evo Morales of the ruling MAS (Movement Towards Socialism) party will likely win in a landslide, returning to his third consecutive term in office. If re-elected, he will be Bolivia’s longest serving leader in history, with the longest tenure of any incumbent Latin American president. Recent polls put Morales 40 percentage points ahead of his closest rival, cement magnate Samuel Doria Medina from the eastern lowlands department of Santa Cruz. The other contenders—former conservative president Jorge “Tuto” Quiroga, center-left ex-La Paz mayor Juan del Granado, and lowlands indigenous leader Fernando Vargas—trail considerably behind. In addition to the President and Vice-President, Bolivian voters will elect 36 senators (4 from each department) and 130 congressional deputies—63 from local districts, 60 from department-wide party slates, and 7 from special indigenous-minority constituencies—to the Plurinational Legislative Assembly. For the first time in this election, all Bolivian citizens living abroad who are registered voters (approximately 272,000) will be eligible to vote, including 4,000 in the United States. Also for the first time, each party has been required, under Bolivia’s new 2009 Constitution, to maintain gender parity by carrying an equal number of male and female candidates on its ticket. This has been difficult to implement in practice, but if successful, the percentage of women in the Plurinational Assembly could be the highest ever in Bolivia, if not the highest in the world. 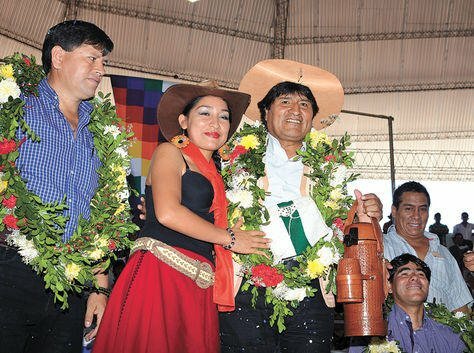 Morales will win, first, because he is a highly charismatic leftist-popular-nationalist leader and Bolivia’s first indigenous president, with whom many in this majority-indigenous country strongly identify. According to recent surveys, Morales’s approval ratings are at around 72%. More importantly, under Morales, Bolivia has experienced unprecedented economic prosperity, the benefits of which have largely been redistributed to the country’s poor and indigenous majority. Morales’s state-led economic policy, emphasizing the re-nationalization of strategic sectors divested by past neoliberal governments (including hydrocarbons, telecommunications, electricity, and some mines), has vastly increased revenues for public works, infrastructure improvements, social spending, and economic benefits. While Bolivia’s GDP has almost tripled since 2005, when Morales was first elected, the minimum wage—up 20% last year alone—has increased at about the same rate. The population living in extreme poverty (on less than $1.25 per day) is down by 32%, the largest reduction in Latin America. The government’s popular cash transfer programs for the elderly, school children, and pregnant mothers have reduced income inequality and infant mortality, while boosting school attendance and high school graduation rates. In short, Morales’s economic and redistributive policies have significantly improved the living standards of average Bolivians, whose increased purchasing power—in addition to fueling economic growth—will readily translate into pro-MAS votes. At the same time, the opposition parties have been unable to unify as a single electoral force, and are generally flailing. 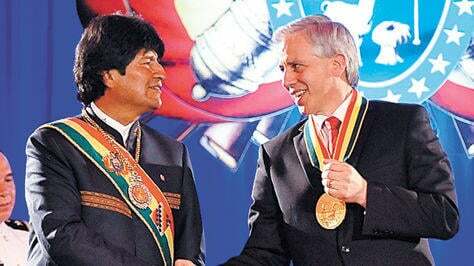 A potential alliance between Doria Medina’s center-right National Unity (UN) party and del Granado’s center-left Movement Without Fear (MSM, formerly part of the MAS) fragmented when Doria Medina pacted instead with Reubén Costas, ex-leader of the Santa Cruz secessionist movement. Quiroga, a late-entry candidate, is now competing with Doria Medina to split the conservative vote. Fernando Vargas’s fledgling Green Party lacks the resources for a national campaign, and is perceived by some as unduly influenced by its European counterparts. The MAS, on the other hand, is an increasingly powerful corporative organization, rooted in popular, union, civic, and business sectors in every region of the country. It has abundant resources at its disposal, from both the party and the government. The MAS currently controls all 3 branches of government, 280 of 335 municipalities, and 7 of Bolivia’s 9 departments. Beyond Morales’s re-election, the MAS is seeking to secure a solid two-thirds super-majority in the legislature, which it does not have currently (due to the defection of 5 indigenous deputies in 2011 over the TIPNIS crisis). In addition to ensuring implementation of MAS’s proposed “Agenda 2025,” according to pro-MAS political analyst Katu Arkonada, this will also allow the MAS to call a referendum for a constitutional amendment to permit Morales’s future reelection—a possibility which Vice President Alvaro García Linera insists is not on the horizon. The MAS has fortified its legislative ticket with well-known national and regional personalities, including former government officials and social movement leaders (such as Carlos Romero, ex-Minister of Government, and Pedro Montes, former head of the COB, Bolivian Workers Central). The party’s “no-reelection” policy for senators and deputies means that there will be a virtually complete turnover of the MAS legislative bloc, with a new slate of “heavy hitters” and party loyalists replacing the more diverse incumbent group. In recent months, the MAS has made concerted efforts to recruit candidates and militants from the opposition parties, with some success. Following the return to MAS of Abel Mamani, a former El Alto community leader and Minister of Water in the first Morales government who defected to the MSM in 2010, some 500 MSM party activists have transferred their loyalties to the MAS. At least 6 MSM congressional candidates (in El Alto andSanta Cruz) have abandoned their campaigns to join the MAS. Another group of 10 refused to accept what theyclaimed were MAS offers of $10,000 and the promise of a municipal post, in exchange for defecting. To date, the electoral campaign has been low on substantive policy debate, primarily featuring conflicts over the electoral process and MAS’s alleged abuses of power. The Supreme Electoral Tribunal (TSE), whose members are elected by the MAS-controlled congress, is widely perceived as inefficient, not transparent, and partial to the MAS. Early on, opposition parties complained that local legislative districts were being redrawn to disproportionally benefit rural voters, who overwhelmingly favor the MAS. The TSE has been criticized for allowing MAS to exploit the advantages of incumbency, while restricting practices—such as the airing of TV “spots” during the official “pre-campaign period”—that would increase the visibility of lesser-known parties. Meanwhile, government ministries with substantial budgets (financed by the public treasury) have continued to promote and publicize the administration’s accomplishments, blurring the lines between government and political activities. The TSE did fine the MAS around $20,000 last August when Morales knowingly introduced a slate of MAS candidates at a public works inaugural event ahead of the date when electoral propaganda is legally permitted. Morales paid the fine, declaring that the campaign publicity was worth the cost. Critics say the MAS government has taken punitive actions against opposition party candidates to discredit and derail their campaigns. Would-be MSM senator Mario Orellana was recently detained and incarcerated on a 3-year old minor charge after he released a tape that could appear damaging to Morales. Prominent MAS candidates, among others, have been widely criticized for sexist remarks that seem to condone or encourage violence against women, a prevalent problem in Bolivia that has garnered attention during the campaign.Hundreds marched in La Paz in early September under the banner “Machistas fuera de las listas!” (“Male chauvinists off the ballot!”), demanding the resignation of several candidates, across party lines, whose remarks and actions have been particularly offensive. In a recent survey, 64% of those polled, across the political spectrum, demanded that the parties prioritize programs to address violence against women. March against “machista” candidates (Wara Vargas, La Razón). Significant controversy has also been sparked by the warnings against “cross-voting,” or splitting the vote across party lines, that have been issued by some popular organizations affiliated with the MAS. A vote for the MAS presidential ticket but against MAS congressional candidates, says Damián Condori, leader of the national peasant federation (CSUTCB), violates decisions made democratically and organically by the communities and will be sanctioned according to norms of community justice. A similar sentiment has been echoed by outgoing MAS deputy Luis Gallego, speaking on behalf of indigenous organizations in the north of Potosí. While the TSE has assured that voter coercion is a crime, Vice-President Alvaro García Linera has defendedthese pronouncements as a form of moral social control, consistent with long-standing highland peasant community traditions. Some MAS leaders worry more about the risk of cross-voting in urban districts, where disgruntled Masistas may rebel against candidates imposed by the party leadership—due to political differences or, in some cases, resentment against the requirement for gender parity. On balance, though, voter discontent with the hegemonic aspects of the Morales government appears to be far outweighed by general economic satisfaction and a strong identification with the MAS’s national-popular agenda. 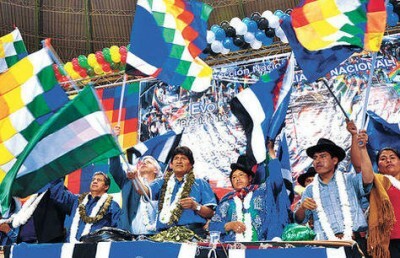 Still, while Evo Morales and the MAS will likely deliver the votes for an impressive victory in this election, and appear to have fragmented and defeated conservative forces to an extent that is unprecedented among other “pink tide” leftist governments in the region, the challenges that remain in Bolivia will be at least as difficult to overcome. These include moving away from extractivism towards a diversified, more productive economy that protects indigenous and environmental rights, while balancing immediate multi-sector demands for improved living conditions, jobs, and services. Whether the new, more centrist political coalition forged through this election will prove capable of accomplishing this goal, in a way that deepens and moves Bolivia’s “process of change” in a progressive, democratic direction, remains to be seen. Emily Achtenberg is an urban planner and the author of NACLA’s Rebel Currents blog, covering Latin American social movements and progressive governments (nacla.org/blog/rebel-currents). 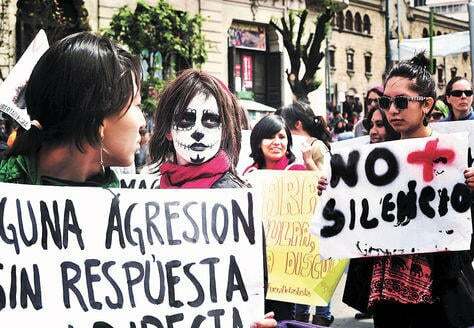 She is currently in Bolivia observing the elections.